Q: Are all sinks available in left and right hand drainer? All Carron Phoenix sinks are available as left or right hand drainer right-hand or left-hand drainer – where a sink is only available in one reversible format this is always specified on our website and in our brochure. Q: Are plumbing kits included? Generally you will need to purchase separate plumbing kit when ordering your sink with your retailer. Q: Can I fit a Waste Disposal Unit in my Carron Phoenix sink? Where a Waste Disposal Unit can be fitted to a sink that has a 3½” waste this is specified on the product page on our website. Q: How do I clean the overflow? Most Carron Phoenix sinks have rigid overflow pipes and can be cleaned by pouring boiling water into them. Alternatively use a proprietary cleaner. Q: Do I need to earth my Carron Phoenix sink? Despite any regulatory enforcement in common with many sink manufacturers, Carron Phoenix makes provision for a mechanical bond to be made to inset sink models. This is often done by utilising one of the cut-out points for the clips along the length of the clip rail. Q: How does one fit undermounted sinks? This depends on the worktop but we would recommend that you seek professional advice. A template and fixing clips are provided in the box. Some circumstances may allow for fitting a bowl directly to the worktop. Alternatively a plywood template can be made to the size of the sink, which will effectively ‘sandwich’ the sink flange, when addressed to the underside of the material. We would recommend the use of a sealant between the flange of the sink and the worktop to avoid any water ingress. In all cases you are advised to consult your supplier. Q: What is the warranty on Carron Phoenix products? For comprehensive information on our Guarantees please click here. Q: Where can I see a colour sample of a sink? Normally at your local retailer, however if you have difficulty, swatches exist for colour matching. For this service contact our Consumer Care team at Carron Phoenix. Granite is exceptionally durable, hardwearing and hygienic. It is resistant to impact, scratches, stains, most household chemicals, colour fading and high temperatures up to 280°c. Granite has a much higher resistance to scratching than any other composite sink material on the market. It is very easy to clean with normal detergents and water. Your Granite sink is manufactured to the highest possible standards. To maintain its good looks, Carron Phoenix suggests you follow these guidelines. Most deposits can be removed with washing up liquid and hot water followed by a clean water rinse. It is also good practice to then dry the sink with a soft cloth as otherwise limescale can build up on the surface. Clean off heavy staining liquids such as dyes and vegetable juices as soon as possible. Then remove any remaining marks using Coloured Sink Cleaner which can be purchased here. It is also good practice to then dry the sink with a soft cloth – such as a Microfiber Cloth – as otherwise limescale can build up on the surface. You can purchase a Microfiber Cloth here. Q: How do I punch out a tap hole in a Granite inset sink? IMPORTANT – Prior to knocking out your tap hole, your sink should be placed in your worktop. Ensure the colour sticker on your sink is located centrally of the pre-drilled tap hole. Place your sink into your worktop. Take a centre punch and place the point in the centre of the coloured sticker. Strike the punch hard with a hammer. This will result in the core of the tap hole to be knocked out. Finish off the tap hole using a hammer and a round file. Q: Can you stop stainless steel scratching? No. When first in use your sink may appear to show up scratches easily. This is because the steel is protected during its manufacture by a layer of plastic film. However, rather like the bodywork of your car, stainless steel can scratch easily. Care must be taken therefore when cleaning or indeed during every day use. Q: How can I remove 'rust spots' from my new stainless steel sink? Carron Phoenix are extremely stringent in the quality and standards required from the steel suppliers. The material used is a high quality chrome nickel steel which is metallurgically incapable of rusting or corroding in normal household conditions. It is therefore unlikely that such rust marks will actually be rusting on the stainless steel sink itself. They are more likely to be the result of small particles of ‘ordinary steel’ which have become attached to the surface then subsequently rusted. Causes can be debris from steel wool (Brillo®) scouring pads, use of steel kitchen utensils, old water supply pipes or sometimes even new taps can pass pieces of steel after installation. Removal is usually possible with a damp cloth and a multi-purpose cream cleaner such as ‘Cif’ which is widely available in supermarkets. The ‘Cif’ should be applied to the sink with a soft cloth and worked in a circular motion. We would point out that unless the particles are completely removed they will return. It is therefore very important that after cleaning the sink, it is dried thoroughly. This process needs to continue at least daily, and for several days after the problem has disappeared to ensure all particles have been removed. The problem is sometimes particularly obstinate to remove and it may take several attempts to restore the sink to its pristine condition. How do I best clean my Stainless Steel sink? The quality of your water can affect the good looks of your sink by giving the appearance of staining. This “staining” is generally a build-up of limescale or similar mineral deposit, particularly prevalent in hard water areas. Limescale readily absorbs staining agents such as tea, coffee, red wine, etc, spoiling the appearance of your sink. For this reason always rinse and dry your sink after each occasion you use it to avoid mineral deposits being left behind on the surface when the water evaporates. For general day to day cleaning we would recommend the use of a proprietary product such as Shiny Sinks which can be used daily. Shiny Sinks is available from large supermarkets and hardware stores, and is also available to buy online from the manufacturer at www.homecareproducts.co.uk. To remove any limescale that has built up on your sink, try using a proprietary limescale removing product such as Viakal® or Limelite®. Alternatively, soak in a solution of one part vinegar to three parts water. This will loosen the scale, making it possible to scrub it away with an abrasive pad and kitchen sink cleaner. For more information on how to clean your sink please click here. Q: How do I find out what cut-out dimensions are necessary for my Carron Phoenix stainless steel sink? Cut inside the overall frame dimension (by inverting the sink on the worktop) by 8mm all round and always use a 20mm (important!) radius at the corners. Cut out sizes are shown on the specification sheet for each sink. If a template is provided, please use that. Q: Do I need to use special sealant when installing Glass sinks? Due to the nature of the backing to the glass of Glass Inset Sinks, it is important that an acid free sealant is used when installing the sink in the worktop. This prevents any reaction between the sealant and the backing to the glass. The acid free sealant we recommend – which we believe is available from Screwfix – is made by Dow Corning® and is called DOW Corning® 799 Glazing. Please refer to the installation instructions enclosed with the sink for more information. Q: How do I best clean my Ceramic Sink? To maintain its good looks, we suggest you follow these guidelines. Most deposits can be removed with washing up liquid and hot water followed by a clean water rinse. It is also good practice to then dry the sink with a soft cloth as otherwise limescale can build up on the surface. The quality of your water can affect the good looks of your sink by giving the appearance of staining. This “staining” is generally a build up of limescale or similar mineral deposit, particularly prevalent in hard water areas. Limescale readily absorbs staining agents such as tea, coffee, red wine, etc., spoiling the appearance of your sink. For this reason always rinse and dry your sink after each occasion you use it to avoid mineral deposits being left behind on the surface when the water evaporates. To remove any limescale that has built up on your sink, try using a proprietary limescale removing product such as Viakal® or Limelite®. Alternatively, soak in a solution of one part vinegar to three parts water. This will loosen the scale, making it possible to scrub it away with an abrasive pad and kitchen sink cleaner. Q: How does one knock out a taphole in a Ceramic inset sink? Q: How do I best clean my Synthetic Sink? Due to its unique coating, Synthetic sinks are resistant to all common liquids etc that are used in the kitchen (tomato sauce, vinegar, red wine etc.). The sink can be cleaned using any brand of cream cleaner eg Cif, and a sponge or cloth. Q: How heat resistant is my Synthetic Sink? Your Synthetic sink can withstand temperatures of up to 300°C. Despite the fact that the Synthetic material is very heat resistant we always advise to use a coaster when putting a hot pan on the sink. Q: Can all Carron Phoenix taps be used in conjunction with a combi boiler? Not necessarily. You are advised to check with the manufacturer. Q: Can I still get spare parts for discontinued taps? Q: How can I prevent my tap 'flexing' on my stainless steel sink? Occasionally a heavy tap can ‘flex’ on some large stainless steel sinks. This can be rectified by your tap being braced, and it is not unusual for people to have this kind of problem with a stainless steel sink, and is not a problem emanating from the sink or tap being defective in any way. Carron Phoenix has developed a tap immobilizing system. Recommended for large or heavy taps, this system is designed to eliminate tap flexing and is installed under the sink, connecting the tap to the underside of the work surface. To view details please click here. Q: How do I best clean taps? Refer to the installation instruction sheet. Use only a soft cloth and soap and water; under no circumstance should any abrasive liquid, powder or scouring pad be used. Q: Is water pressure critical when I choose a particular Carron Phoenix tap? Depending on the style and age of your house, you may require a specific style of tap, a model that is appropriate to the water pressure available in your kitchen. Specifically, many older properties will require a tap which has been designed to work best with lower water pressure or gravity fed systems. For more information visit our Tap Ratings page here. Q: I've heard that ceramic disc mechanisms never go wrong. Is this true? Operationally ceramic discs can last for the life of the tap. However, mechanisms can be affected by water borne particles or hard water. Please contact us should you require assistance or to obtain replacement valves. Q: What dimension of tailpipes do Carron Phoenix taps have? Check the specification sheet for your particular tap. Generally they are 15mm. Q: What is the warranty on Carron Phoenix taps? Carron Phoenix taps are guaranteed for 5 years against manufacturing defect. Q: Where can I get spare parts and/or replacement accessories? Q: Where can I see a sink/tap similar to the one I am considering? Contact your nearest Carron Phoenix retailer, by going to the sink/tap section and using the Find a Retailer link. Before visiting however, please contact the retailer to check availability of the product. Q: Will my Brushed Nickel tap match my polished finish stainless steel sink? Carron Phoenix taps are designed to complement Carron Phoenix sinks, and not necessarily match exactly. Brushed Nickel taps will complement brushed finish appliances such as an oven and hob in your kitchen. Q: I have moved house – why does the water taste and smell different? The makeup of water (including the levels of chlorine) varies from area to area and this will mean that the water may taste or smell slightly different from the water that you were used too. Another reason may be due to our having to alter the treatment process slightly depending on the weather, demand and time of year. These factors all affect the levels of chlorine that we must add to the water which in turn will slightly affect the taste and smell. Q: Why does my water taste salty? Incorrectly installed water softeners, fitted to washing machines for example, can cause salty tastes and contaminate the drinking water supply. Do not drink water from water softeners because it contains high levels of salt – you should always use a tap with unsoftened water for cooking and drinking. Q: Why does my water have a TCP / Metallic taste? TCP tastes can occur when the internal stop tap has been operated to carry out any work, or if the tap is operated after many years of not being used. Washers can start can start to degrade over time and cause TCP taste and odour problems. However this applies more to properties where the internal stop tap is more than a few years old and is seldom or never used. Since TCP like compounds are formed when the chlorine reacts with plastic or rubber, this sometimes means that the TCP taste is more noticeable when the Chlorine level is highest. Although Chlorine is added to water continually a demand for water can mean that it may sometimes have a higher level of chlorine in it, for example, in the morning or when you get home from work. Q: What size taphole cut out do I need for my Carron Phoenix tap? All Carron Phoenix taps require the industry standard taphole cut out size of 35mm diameter. Q: Is the water from the Carron Phoenix Seraphina tap really 100°C boiling water? Yes. The water is stored under pressure at 110°C in the heating tank and is boiling (100°C) when it leaves the spout. Q: Is there a safety function on the tap? Yes. The tap has a safety button fitted in the boiling water handle which needs to be activated to operate the boiling water function. When this button is released the handle closes automatically and shuts off the supply of boiling water. As you would expect when dealing with boiling water, sensible precautions need to be taken when operating the boiling water function. Q: Can I position the boiling water handle to the left or right side? The Seraphina can be installed with the boiling water handle either to the left or the right side. We recommend that you position the spout opposite to the boiling water control when operating, bearing in mind the position of your sink bowl(s) and whether you are left or right handed. Q: Does the tap get hot in operation? The Seraphina 3-in-1 Instant Boiling Water Tap has an insulated spout and operating handle. Q: Can I replace my existing tap with a Seraphina tap? Yes. As the Seraphina fits in a standard 35mm tap hole it can be retro-fitted to replace an existing tap. Q: Do I need to pay to have a separate taphole cut in my granite worktop to install the Seraphina tap? No. The Seraphina tap can be installed in a standard 35mm diameter tap hole. Q: What is the function of the conditioning filter supplied with the Seraphina system? The primary function of the filter supplied as standard with the Seraphina system, is to protect the heating tank from the build-up of limescale deposits and remove chlorine to improve the taste and odour of the boiling water. Q: How often does the Seraphina conditioning filter cartridge need replacing? The Seraphina filter cartridge should be replaced every 6 months to maintain your warranty. Routine replacement of the filter cartridge is particularly important in hard water areas to prevent limescale forming and potentially damaging the heating tank and the tap. Q: Does the Seraphina tap have a cold filtered water function? No. The boiling water is filtered, but there is no provision for cold filtered water. Q: How much space is required to install the Seraphina system? Due to the compact design of the Seraphina system – 550mm x 211mm x 142mm high – it will fit comfortably inside a standard 600mm kitchen cabinet. Where space is at a premium the heating tank can be installed in the kick space behind the plinth of the cabinet, but bearing in mind that it will be necessary to provide convenient access to operate the tank reset button. Q: What electrical power supply is required for the Heating Tank? The heating tank is supplied complete with a power lead fitted with a standard UK 3 pin plug, for plugging into a standard 220/230 volt household supply. Q: What is the minimum and maximum water pressure for the Seraphina system? To operate correctly the Seraphina heating tank requires both the hot and cold mains water pressure to be minimum 1.5bar (23psi), maximum 5bar (75psi). On no account should the water pressure exceed 5 bar (75psi) or the pressure relief valve will bypass and dispense cold water. We recommend that a professional plumber is employed to measure the water pressure at a low demand period. It is preferable for the hot and cold supply pressures to be equal. Q: What if the water pressure is above the maximum of 5 bar? A Pressure Reducing Valve should be installed in the water supply to the heating tank. A suitable Pressure Reducing Valve can be purchased from any plumbers merchant or online at www.frankefilterflow.co.uk. Q: What is the boiling water recovery time? The Seraphina tap will dispense up to 47 cups of 100°C boiling water per hour with a recovery time of 15 minutes from empty. Q: Is it cheaper to operate than my normal kettle? Boiling a kettle can be a waste of water and time; the Seraphina 3-in-1 Instant Boiling Water Tap is effectively insulated and unlike a kettle there is no waste of boiling water, meaning less energy used and savings in water and electricity. Q: My fitter has plugged in the tank and switched on the power supply before filling it with water and tripped the safety override; what can he do? The tank is fitted with a safety device that will shut-off the boiling water if the tank is switched on without water, or there is a power surge. The hot water flow can be restored by operating a reset button, located behind a white plastic cover, on the front of the tank (opposite side to where the braided inlet and outlet hoses are connected). Disconnect the tank’s electrical power supply. Operate the boiling water handle on the tap to check that the tank is full of water. Use a small screwdriver to remove the white cover to reveal the button in the recess. Press the button firmly with the flat end of a pencil until you hear a click to reset the tank. Replace the white cover. Switch on the power supply and allow 20 minutes for the tank to reheat before use. Q: I live in a hard water area – is this a problem? Like any kettle this depends on how hard the water is in a particular area. If you have a particular issue with limescale, you can contact FilterFlow on 0808 165 0008 to get another Inline Filter or a replacement type of filter that will do the job of reducing limescale. Q: I am going on holiday – what should I do? Simply unplug the Heating Tank whilst you are away. On your return, plug the unit back in and turn on the boiling water tap to drain the water from the tank. Once the tank has refilled and heated (22 minutes) the tap can be used in the normal way. The warranty period is 2 years on the Heating Tank and 2 years on the Seraphina 3-in-1 Boiling Water Tap. Guarantees valid only on products placed and used in normal domestic situations. Q: My tap splutters and spits, is this normal? The tap dispenses boiling water at the outlet of the spout and, as a consequence, there will be some splutter, steam and noise. This can be quite off-putting at first, but any concerns are quickly dispensed with once the simple technique for operating the boiling water is understood. Simply rotate the tap handle carefully to run off the lag of non-boiling water until the water starts to steam; then stop, put the receptacle completely over the end of the taps spout and continues to dispense the boiling water, at the same time gradually lowering the receptacle. Adopting this method ensures all of the boiling water is contained and prevents any splashing your hands. Q: What is the Tundish and what does it do? 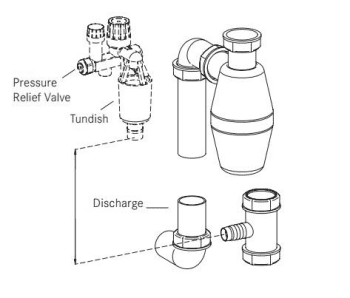 The Tundish is a plastic cup which hooks on to the pressure relief valve. Its job is to catch the drips from the Pressure Relief Valve, and it is also a water trap to prevent any unpleasant odours escaping from the sink waste. The Seraphina tank is sealed, so it is supplied with a Pressure Relief Valve to allow it to vent. Once the tank is switched on and the water begins to heat, steam is created and the pressure starts to build. Once that pressure reaches 5 bar, the Pressure Relief Valve opens to relieve the pressure. The steam condenses on the end of the Pressure Relief Valve and drips into the Tundish. The Tundish is connected to the sink waste so the water can run to drain. The Pressure Relief Valve should not constantly release water. It will constantly drip for the first 20 minutes after the tank is switched on, it should then only periodically drip, either after you’ve drawn off some water, or just every now and then when the tank needs to come back up to temperature.If the Valve is constantly dripping or running then the cause usually high water pressure – water pressure exceeding 5 bar will cause the Valve to constantly release water because it is designed to open at that pressure. We recommend checking the water pressure with a gauge, and if it is near 5 bar fitting a pressure reducing/limiting valve fitted and limit the pressure to 3 – 4 bar. Pressure reducing valves are available from any good plumbers merchant and if high pressure is the problem then fitting one will solve it. Q: Does my Carron Phoenix Carronade Waste Disposal Unit have an 'Auto Reverse Function'? One of the advantages that the Carron Phoenix Carronade Permanent Magnet Motor disposers have over standard Induction Motor WDUs is the starting torque – Carron Phoenix Carronade WDUs are up to full speed within the first revolution. Most jams occur at start-up because food waste will be stuffed into the disposer until it is full (this is not the correct way to use the disposer but is more reality). Q: Is a Waste Disposal Unit expensive to operate? A Carron Phoenix Carronade Waste Disposal unit consumes roughly the same power in one month to lighting a 100 watt light bulb for one hour, therefore operating costs are relatively low. The high torque fast grinding Carronade units use very little water. Q: What is a Waste Disposal Unit 'Air Switch'? The Carronade air activated control switch button operates continuous feed waste disposal units from a point determined by the consumer, eg on the worktop or possibly even within the sink perimeter. Air switches are safer than electric switches because they keep the electricity away from the users’ hands. The air switch control mechanism usually mounts under the sink (or is incorporated into the Waste Disposal Unit itself), where it remains dry. From the activated control switch button, an air tube connects with the switch controller, which in turn operates the unit. The benefit is that the operational switch avoids the necessity to have a wall mounted toggle switch (which itself is electrical), and is therefore neater and safer to operate. Q: How do I care for my Glass Chopping Board? Q: How do I care for my Wooden Food Preparation Platter? Wood is a natural product it is therefore subject to absorbing moisture, and if the quantities of moisture are not equal on both sides it can bow especially so when the product is first used. However, this can be corrected by wetting the board on both sides and leaving it to dry overnight on a flat surface with the convex side uppermost. This is most conveniently done with the board placed over the bowl.This enables the warp to drop out and as the board gets more use it will eventually stop warping. Do not put the board near a heat source and do not put it in direct sunlight to dry. Q: How do I link to the Carron Phoenix website or obtain a Carron Phoenix logo? Please contact us by email sales@carron.com or by telephone on 0161 436 6280. Q: How do I obtain brochures? You can view the latest Carron Phoenix brochure on our website here. Carron Phoenix Retailers should contact their Distributor to obtain brochures. Q: Where do I go to complain if I have a problem with a Carron Phoenix product?